Gun Owners of America expressed similar concern with Barr's nomination and sent out an action alert to gun owners across the nation. The group encouraged their members to call their Senators and let them know they oppose Barr because of his alleged anti-gun position. "...when Barr openly spat on the right to keep and bear arms on Tuesday -- and threatened to break down our doors in the middle of the night in order to confiscate our guns -- well, that’s a problem for us," GOA's Executive Director, Erich Pratt, said in the alert. "Listening to William Barr, there is no doubt that he will be an enemy of the Second Amendment. He even talks like an anti-gunner." Gun control questions will be on the agenda for William P. Barr. Both because of his willingness during his 1991 confirmation hearing to accept, under certain conditions, an assault weapon ban as well as concerns about Red Flag laws, also called Extreme Risk Protection Orders (ERPO). ERPOs allow courts to confiscate people's guns merely on the basis of “reasonable grounds” for believing that a person is a danger to himself or others. But the laws never spell out exacting criteria for meeting these evidentiary thresholds. It is left to the eye of the beholder (in this case, a judge) to determine if someone poses a danger. Those who are involved in enforcing these laws will identify people based on violent histories, or even on the basis of age or gender. But people who are convicted of felonies are already prohibited from owning guns. If gun control advocates think that people should lose the right to self-defense because of a simple arrest, there is a real concern that blacks and Hispanics will be disproportionately targeted by these laws since both groups have much higher arrest rate records than whites. There is a real concern whether Barr will fight against what will obviously be such discriminatory laws. Based on available testimony, President Trump’s nominee for attorney general is one which the firearms industry and gun owners find confidence in to protect the rights and focus efforts to reduce the criminal misuse of firearms where it is most needed. Mr. Barr’s testimony indicated he share NSSF’s view there is more attention and resources needed to address mental health and ensuring prohibited persons never possess a firearm. He cited the Fix NICS Act, signed into law last year and named for NSSF’s campaign, to encourage states to submit all disqualifying adjudicated mental health and criminal background records to the FBI’s National Instant Criminal Background Check System (NICS). 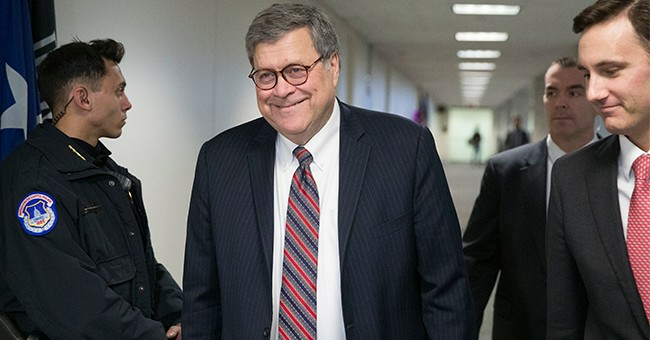 Additionally, Mr. Barr explained in his testimony that when he previously served as attorney general, he held then, as now, that the Second Amendment is an individual right that includes the right to possess modern sporting rifles, which he said the Heller decision vindicated his convictions. He rejected calls for bans of these semi-automatic rifles and said efforts that don’t focus on keeping firearms from prohibited individuals are rhetoric. Everything presented so far indicates the firearms industry would find faith in Mr. Barr as attorney general to protect the lawful commerce in arms. The National Rifle Association of America did not respond to Townhall's request for comment.